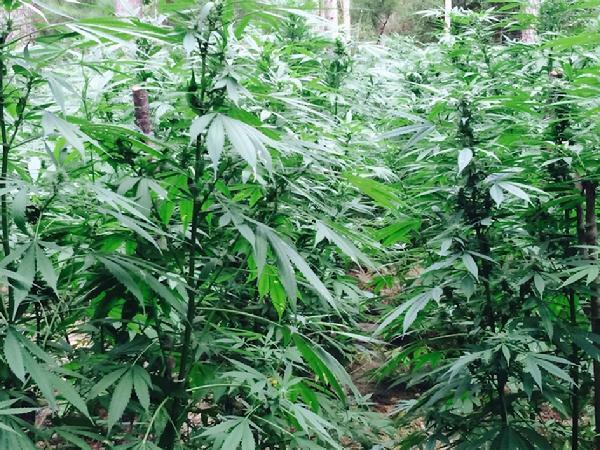 Marijuana Field Caretakers Heavily Armed and Dangerous Evidence Suggests, LIVINGSTON, August 11, 2014 - On 8-4-2014 complainants came to the Sheriff’s Office in reference to suspicious activity on property located off FM-943 in Polk County, Texas. Detective’s with the Sheriff’s Office started an investigation into land owners in the area where the activity was taking place. Polk County Sheriff, Hammack said DPS Helicopters flew over the area on 8-5-2014 and observed several fields of marijuana growing. Detectives and canines entered the area in an attempt to locate suspects working the fields and none were located. Lieutenant Andy Lowrie with the Polk County Sheriff's Office Narcotics Division stated that catching suspects in these types of marijuana fields is almost impossible. Lowrie stated that Polk County doesn't have the manpower required to set personnel in and around these fields twenty four hours a day in an attempt to catch someone. Lowrie further stated that they were very lucky when one suspect was caught fleeing from one of the fields in the Goodrich area. Lowrie stated that there is an ongoing investigation into the responsible parties with several good leads. On 8-6-2014 personnel from several different counties and agencies collected evidence from the camps and fields located near FM-943, with a total plant count being 6545 plants from 5 fields. Lowrie said the many subjects in the 30 fields in Goodrich were armed with 22 and 45 caliber pistols. The subjects working the fields off of Fm 943 were armed with 223 and 7.62 rifles, 12 gauge shotguns and a 22 caliber pistol. The subjects working the fields off FM-943 have already approached land owners in the area telling the land owners which land to clear and which land not to clear. The credit for the two fields go to the citizens of Polk County who turned the information into Law Enforcement which led to the discovery of the fields and to the many agencies who came to Polk County to help collect the evidence and plants. Sheriff Hammack said he was thankful to the several agencies, business owners, citizens and the Polk County Commissioners who assisted in the two operations.